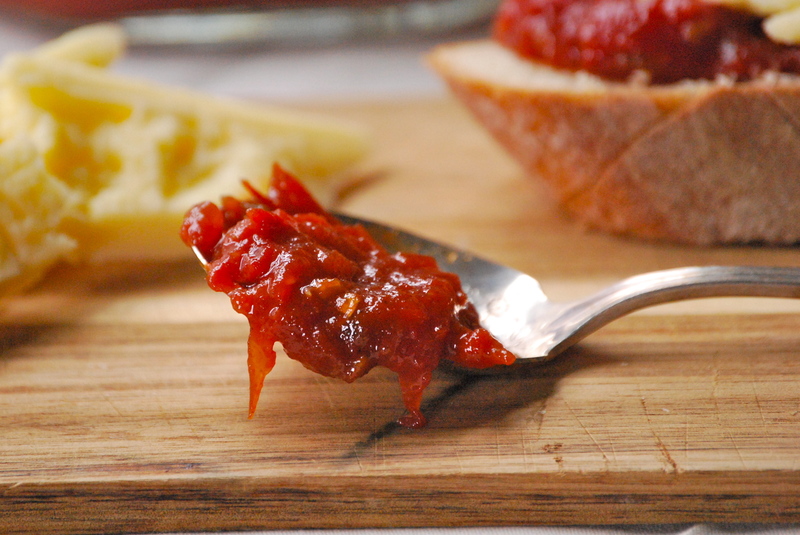 You are looking at my latest addiction– tomato jam. You read correctly, it’s jam made from tomatoes. I’ve been eating this heavenly spread on everything lately. Now you may not have heard of tomato jam, but in food circles it seems as though everyone is talking about it. The recipe is simple and easily adaptable into both sweet and savory versions. To me, it’s perfection in a jar. So how simple is it? Just chop up the tomatoes, add a few spices, and plop everything in a kettle. Stir. Wait an hour, or so for it to thicken. Done. Depending on what you add, you can make it as sweet or savory as you like. I’ve been using both versions… a lot. 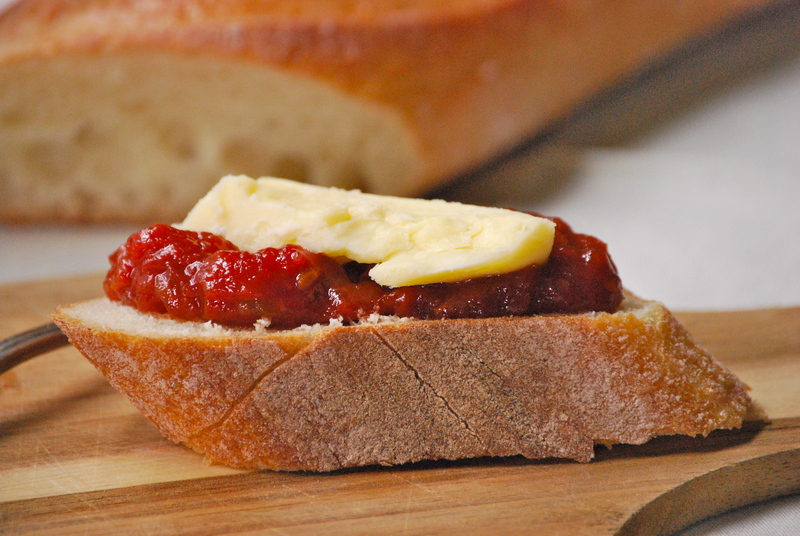 The sweet jam pairs beautifully with crusty bread and a rich cheese, like a nice white cheddar or goat cheese. Or how about serving it on top of a beautiful round of brie, with cocktails? 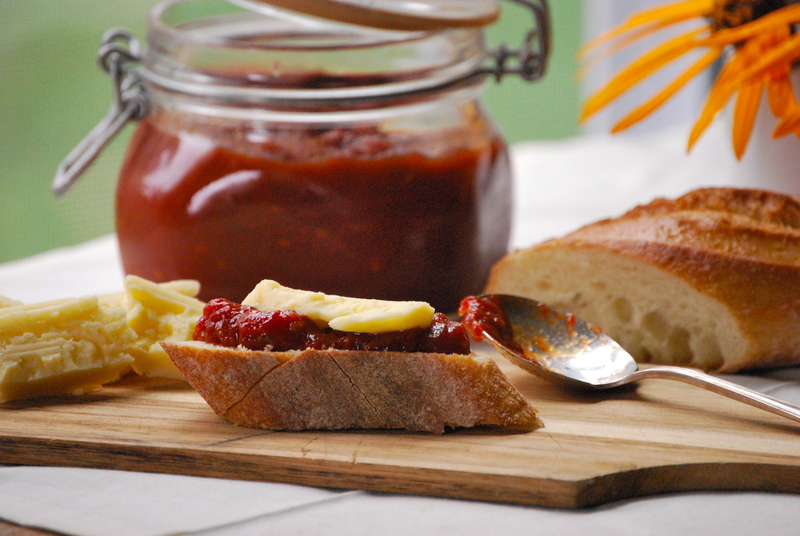 The savory jam is a perfect match for eggs, bacon, or braised meat sandwiches. And that’s just the start. Once you taste this topping– like me, you’ll spread it on everything. Like any other jam, you’ll want to refrigerate this one (it should be used within 2 weeks). You can also ‘can’ the jam for later by following basic canning instructions. That way you’ll have it available throughout the winter. It’s a good idea to double or triple (or more) the batch if you’re going to go through the work of canning it. It’ll need 20 minutes in a hot water bath. I’ll certainly be canning several jars, because for the past few weeks I’ve been starting my day off with an egg and tomato jam breakfast sandwich. And I don’t want this new-found favorite to end anytime soon. It’s so quick and easy. Try it, you’ll be happy you did! Combine all ingredients into a large, heavy- bottomed sauce pan. Bring to a boil. Reduce heat and simmer, uncovered. Make sure to stir often. Cook for roughly 1 hour, or until it reaches your desired consistency for jam. Remove from heat and let cool. Place in a jar and refrigerate. Combine ingredients into a medium, heavy -bottomed sauce pan. Bring to a boil. Reduce heat to simmer and cook uncovered, stirring frequently. Cook for roughly 45 minutes, or until the mixture has reached your desired jam consistency. Remove from heat, cool, and refrigerate. I hope you enjoy both versions of tomato jam. Have a wonderful day and thanks for stopping by. I’m going to have to try this; everyone is talking about it! I feel like I’m missing out on something wonderful. That looks incredible. My tomatoes are long gone sadly. I FINALLY made this the other day. SO GOOD Laurie! and so easy too! Can this jam be canned using a hot water bath? If yes, do you know if there would be any changes to you original instructions? Yes, I’ve tested canning the second version (the smokey one) and the recipe complies with safe canning guidelines as far as I can tell. Process the jam in two half pint jars in a hot water bath for 15 minutes following basic canning instructions (sterilized equip, etc). Fantastic! This will be my weekend project! Thank you! I’ve spent last evening and half of today reading your recipes. Many look delicious. I, too, enjoy the “old-timey” ways…preserving, fermenting, etc. Can’t wait for tomatoes to go on sale again, so I can try your sweeter version of this jam. I’m looking for the taste of the tomato preserves my mom made when I was a kid – I’m 69 years old. I just made one a month ago that was too spicey, like a chutney with too much chile, not enough sugar & citrus.